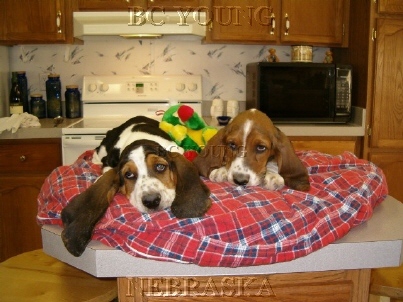 Welcome to our AKC Basset Hound Puppy Site. Here you will find some of the most loved, adorable and cared for puppies on the net. Our Puppies will have all shots and deworming up to date.Our Basset Puppies will come with AKC Registation Papers, Pedigree Available, Shot Records,Health Certificate, Health Guarentee, Well Socailized and Started on Pody Training(know how to use a puppy door / newspaper).Our Basset Puppies will be used to kids and other animals. I craddle our Basset Puppies just like little babies and look into their eyes and tell them how precious they are.Our Puppies are treated with lots of love and special attention. We live out in the country by Ord, Nebraska. We have a few adult Basset Hounds. They are just like part of our family. We have plenty of land for them to run and snoop. 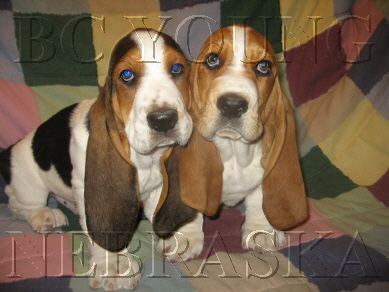 We are right there beside our New Basset Mommys when they are giving birth, so that should tell you how important it is to us to find very loving homes for our puppies. I spend time with our puppies in the morning, afternoon and evening and can tell each one of them apart, just like you can your own kids. I do my best to match our puppies personality with their new family and their lifestyle.